2 canali selezionabili (normal e drive per il distorto). Presa per cuffia. Presa per altoparlante esterno. EQ a 3 bande. Copertura in Tolex nero. Gli ampli della serie Frontman abbinano, grazie allo speciale overdrive e all'inimitabile look Blackface, un grande suono, ad un'estetica curatissima e ad un piccolo prezzo. Il Frontman 10G 10-watt ha un cono da 6" Special Design ed un versatile controllo di gain selezionabile che permette di ottenere un'ampia gamma di suoni, dai leggeri overdrive alle distorsioni più esagerate; perfetto per blues, metal e per il famoso suono pulito Fender. Il design closed-back gli conferisce un'incredibile profondità sulle basse frequenze; l'ingresso da 1/8” consente di collegare una sorgente sonora esterna per potersi esercitare con le basi, mentre la presa cuffie è ottima per esercitarsi silenziosamente. FENDER Frontman 10G. Amplificatore per chitarra elettrica. Vendo AMPLIFICATORE 10 WATT PER CHITARRA FENDER Frontman 10G, usato poche volte, testato con chitarra Fender e funzionante. Speaker: 1-6" Fender Special Design Speaker. Unique Features Amplifier Weight: 8.5 lbs (3.8 kg). Fender FRONTMAN 65 R, e-chitarra amplificatore, solo la AMPLIFICATORE! Das Gerät wurde getestet und funktioniert. Die Hallspirale ist dabei, ein Netztkabel absichtlich NICHT! FENDER FRONTMAN 10G AMPLIFICATORE PER CHITARRA ELETTRICA 10 G 10W GARANZIA ITA. FENDER - FRONTMAN 10G. AMPLIFICATORE PER CHITARRA 10W. Il design closed-back gli conferisce. Speaker: 1-6" Fender Special Design Speaker. Potenza: 10 watt. Power Handling: 10 Watts. l'ingresso da 1/8” consente di collegare una sorgente sonora esterna per potersi esercitare con le basi. Cavo e istruzioni operative inclusi. Potenza: 15 W R.M.S. 31,4 cm (h). Amplificatore per Chitarra FENDER Frontman 15R con riverbero. Combo per chitarra 38W. Presa per cuffia. Presa per altoparlante esterno. 31,4 cm (h). Potenza: 15 W R.M.S. (FENDER Frontman 10G. AMPLIFICATORE 10 WATT. Speaker: 1-6" Fender Special Design Speaker. PER CHITARRA. Power Handling: 10 Watts. INFORMAZIONI PER ACQUISTARE DA SPEVI CON SERENITA' n. 24 del 2 Febbraio 2002). 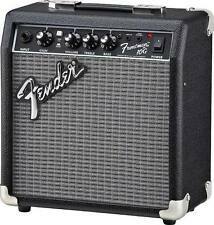 Fender Frontman 65 R 1x 12 Combo mit tollem Sound, guter zustand, funktioniert einwandfrei. Es handelt sich um perfekt vernähte Kunstleder-Schutzbezügen in top Lederoptik.Ideal für Aufbewahrung oder Transport! --- Fender Frontman 212R ---. Dies ist eine Schutzhülle passend für. Fender® Frontman# Verstärker kombinieren perfekte Tonqualität mit einem umwerfenden Preis und dem unverwechselbaren Fender Blackface# Look. Dafür sorgt der eingebaute, perfekt abgestimmte Overdrive. Frontman® 10G. - Boutons: Boutons pour ampli "Skirted". Ce qu'en dit FENDER - Haut-parleurs: 1 haut-parleur de 6" Fender® Special Design. - Hauteur de l'ampli: 11" (27.9 cm). - Profondeur de l'ampli: 10.25" (26 cm). Altavoz Fender Special Design de 6”. Interruptor Overdrive. NO realizamos envíos a las islas CANARIAS, CEUTA Y.
Fender Frontman 10G 10W Combo Amp (NUOVO). Un antipasto amplificatore ideale, il Fender Frontman 10G guarda e suona alla grande e dispone di tutto il necessario per ottenere subito a suonare. Caratteristiche Fender Frontman 10G 10W Combo Amp principale. FENDER VERSTÄRKER : FRONTMAN AMP E-Gitarren Verstärker. 38W - 230V - 50Hz. Il Frontman Fender 10 G è un amplificatore pratico. È dotato di una cassa da 6 pollici e un equalizzatore a 2 bande. Der Fender Frontman 10G ist ein praktischer Übungsverstärker zum günstigen Preis. Dank Kopfhöreranschluss ist auch stilles üben möglich. Auch und gerade die Einschaltung eines Rechtsanwalts bezüglich einer für uns kostenpflichtige Abmahnung und (strafbewehrte) Unterlassungserklärung ist als Verstoß gegen § 8 IV UWG anzusehen, da dies insbesondere vorwiegend dazu dient, gegen den „Zuwiderhandelnden“ einen Anspruch auf Ersatz von Aufwendungen oder Kosten der Rechtsverfolgung entstehen zu lassen. FENDER FRONTMAN 10G. FENDER - FRONTMAN 10G. grande suono, ad un'estetica curatissima e ad un piccolo prezzo. Il Frontman 10G 10-watt ha un cono. AMPLIFICATORE PER CHITARRA. Il design closed-back gli conferisce un'incredibile. Fender Frontman 65 R, E-Gitarrenverstärker, Nur der Verstärker! fender Frontman Reverb Practice Amp. In very good condition sound great not had much use Will be well wrapped for postage thanks for looking. Fender Frontman 25R. Model #PR225. (AA-76). Condition is Used. Shipped with FedEx SmartPost. Fender Frontman 25R. This outstanding Fender amp is in good condition. We fully tested this amp and were very impressed with the overall power and the quality of the sound. All lights work as they should. Drive Section with Gain Select. This is the older model, Nicely made. Good Working Condition. NEW - FENDER 2-BUTTON CHANNEL/EFFECTS FOOTSWITCH WITH 1/4" JACK. Cable is not included. We do not accept wire transfers. Other alphabets (Cyrillic, Japanese, Chinese, etc.) will not be translated and your item will be delayed. Fender Frontman 10G 10W Guitar Combo Amp Main Features. An ideal starter amp, the Fender Frontman 10G looks and sounds great and features everything needed to get playing straight away. TheFender Frontman 10G features classic Fender Blackface looks with it's black covering, silver grille and skirted knobs. The Frontman 10G is perfect for beginning guitarists, students and teachers and guitarists on a tight budget looking for an "extra" practice amp. The world-class, value-priced Frontman 10G combo amplifier makes practice sessions lots of fun! Fender Frontman 10G Overview by GAKEasy-to-Use Practice Amp for the beginning electric guitarist or anyone who wants a small, easy-to-use practice amp with quality tone and a great price, the Frontman 10G is at your service. This is a 15G Frontman. The amp is about 13 x 12 x 7. The amplifier is not new, it is old in age. This amp is pre-owned and possibly used. The amp powers on and is functioning. Fender Frontman Electric Guitar Amplifier. Or small PA system! w/FREE NEW mic! Up for sale is a severely underrated amp that should go down as one of the greats.the Fender Frontman Reverb amp. (15W Black model.). Also includes a cable/cord and adaptor plug that attaches the mic to the amp as well as a mic clip and little desktop stand. This is alike new item in orignail box Fender frontman 15G. the box is missing its top. 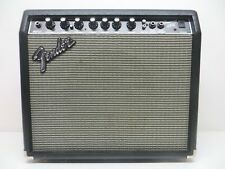 Fender Frontman 25R Amplifier, Excellent Condition! This nice little amplifier belonged to a good neighbor friend who passed away. He took care of everything he owned. I've tested it and everything works as it should. Great sounding! Fender Frontman 15G Guitar Amplifier. Retro looking. With power cord. Used Fender Frontman 15G Solid State Combo Electric Guitar Practice Amp in good working condition. All our products are tested to the best of our ability to ensure you receive a quality & working product.